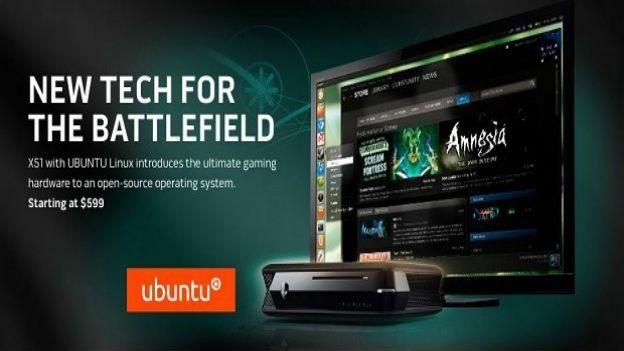 Dell have announced that they will now be offering the Ubuntu Linux OS on Alienware's X51 gaming PC, bringing Steam to the little desktop. The Alienware X51 starts at just $599 configured with Ubuntu Linux and an Intel Core i3 processor. Alienware's official site states, "Its open-source operating system allows users to experience Ubuntu in a flexible manner that is unique to their preferences and its flexible interface can be customized to suit the user's needs." Users can access Steam For Linux on the gaming rig to play over 25 gaming titles, with more expected to come. The in-built Ubuntu Software Centre also includes thousands of free applications with a personal cloud service "Ubuntu One' offering 5GB free storage. Steam For Linux was released in February and reformatted its experience at the end of 2012 enabling 'Big Picture' mode when you hook your X51 to HDTV. So far, Valve's Steam Linux library only contains 165 games compared to Windows 1,199 titles available but has only recently exited the beta stage. Valve has also recently announced a modular PC, the 'Steam Box' that will support Steam's online gaming service and Big Picture. Alienware have previously released popular gaming PCs and laptops such as the Aurora R3 and M11X. Dell has enabled users to purchase an affordable option for the entry-level 'mini gaming desktop' X51. Does the Alienware X51 provide a genuine alternative to a games console?